These days it seems like there are security solutions for almost everything except, the one thing you can never fully secure - humans. But, while you can’t control everything they open or click on, you can control their access to your sensitive data. In addition to stresses from these three changes, the number of government regulations that influence how business is conducted across many industries continues to rise. From healthcare to banking, the number of regulations can climb into the hundreds, making full compliance more difficult and complex than it has ever been. This increase in regulations along with the increase in complexity of access rights (such as increased applications, devices, etc.) means that organizations must make standardized and closely managed identity access a top priority. These policies are known as Identity Governance and Administration (IGA). HOW DOES IGA COMBAT THE TOP 3 RISKS? Risk from routine changes – Faster, more accurate onboarding of new employees, contractors, and business partners by using roles, business-friendly user interfaces, and policy-driven approval workflows. These help to ensure least privileged access during day-to-day operations such as on/o­ boarding users and performing access reviews. Risk from business changes – With roles based access control you can build out new roles faster and more accurately for employees impacted by business changes to prepare for a reorganization or merger or acquisition. 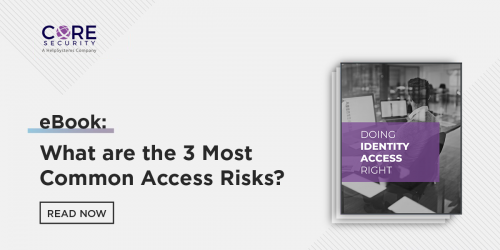 It is also possible to easily view directly assigned and hidden access and quickly identify outlier access both before and following business changes such as a reorganization or M&A activity. Risk from infrastructure changes – New application rollout? No problem. By adding in the new application using your IGA solution, you can quickly provision whole teams at once and get them started within minutes with the correct, least privileged, access required to be eff­ective from day one. These are only a few examples of ways that IGA can support and enable the business as well as help ensure proper access based on your policies or on industry regulations to remain compliant.